Coordonnateurs : Goldstein Laura H., McNeil Jane E.
While often viewed as a specialty within clinical psychology, neuropsychology and its applications remain highly relevant to all areas of clinical practice involving patients with alterations in cognitive functioning. 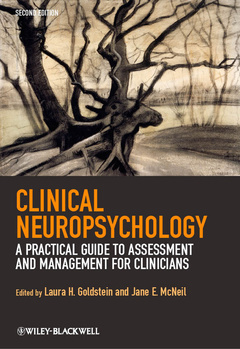 Updated and revised to reflect the current state of knowledge in the field, the second edition of Clinical Neuropsychology provides trainee and practicing clinical psychologists with an invaluable overview of a wide range of neuropsychological assessment and rehabilitation issues in the context of recent neurophysiological, neuroanatomical, neurological, and neuroimaging developments.. While the primary focus continues to be on areas of knowledge and skill to enable practicing clinicians to assess the cognitive functioning of clients and consider suitable rehabilitation and treatment options, a variety of new topics are featured here. These include the evaluation of research designs and neuropsychological interventions, working with clients with very severe and profound brain injury, differentiating between clients with different subtypes of frontotemporal lobar degeneration, the proper assessment of mental capacity, and the impact of cognitive impairment on driving ability.